The Schwarzwald is renowned for its three long distance north-nouth trails: Westweg, Mittelweg and Ostweg, which all start at Pforzheim. 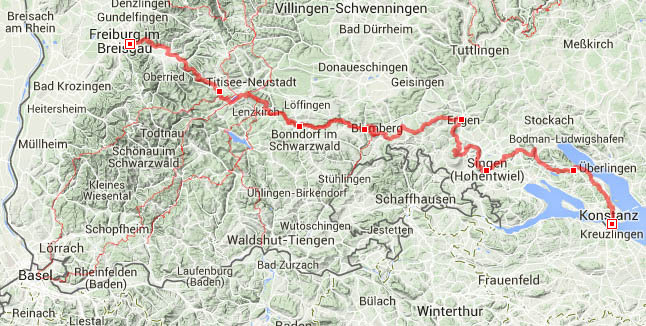 The 285Km Westweg, opened in 1900, is the most famous, being the oldest long-distance hiking trail in Germany. In addition there are some four lesser known east-west trails in the Southern area, named "Querwegen", literally "cross trails" The Querweg Freiburg-Bodensee is the longest cross trail, being a west-east hiking route from Freiburg in the Black Forest to Konstanz on the Bodensee and totals 180Km in length with over 8000 metres elevation change. This hiking trail was opened in 1935 and despite not being as well-known or popular as the three north-south trails, the Querweg takes one through quite diverse landscapes. From its start in the beautiful old university city of Freiburg, the trail follows the narrow Höllental reaching the heights of the Hochschwarzwald towards Hinterzarten. After Titisee, the largest natural lake in the Schwarzwald, the Querweg climbs to its highest point (1190m) near Saig, then heads down to Kappel and through the beautiful and wild Wutachschlucht (which I had already walked through in 2012) to Achdorf. From Achdorf, the Querweg continues to Engen and through the volcanic Hegau region to Singen. The last stages cross the forested Bodanrück, a peninsular between the Untersee and Überlinger See. After another ravine, the trail skirts the shore of the Bodensee to its end in Konstanz. I've been meaning to walk the Querweg for the last 10 years as a prelude to the HamRadio convention at Friedrichshafen, but this project never materialized as I always preferred to go hillwalking in the Montafon Alps instead of a trail hike. However, in 2014, I decided that I'd neglected this trail for too long and made plans to walk the Querweg in 2015, its 80th birthday. The Querweg is usually walked in 8 stages, some of which are quite long. I decided to take 9 days instead, dividing the usual fifth and sixth stages (Achdorf to Singen) into three days and hopefully have time for a ride on the Sauschwänzlebahn. As this trail isn't so well known or publicized, no Hikeline Wanderführer or Publicpress map has been published and no dedicated website exists for the Querweg. However, I was able to purchase a small, but useful Wanderführer from the Fernwege website and four 1:35000 maps from LGL to assist in planning my walk. I also downloaded the Deuter App for both my iPhone and Nexus tablet. This app allows me to install and use the offline maps from Outdooractive which work well with the internal GPS of my devices. To get to the Querweg trailhead at Freiburg, the obvious choices of airports are Basel or Stuttgart. However, I was going on to Lindau after completing the walk, so chose to fly to Zurich instead. Again, I used some Avios points to pay for the British Airways ticket. Unfortunately, no early morning reward seats are available on the London City route, so I had to be content with flying from Heathrow instead. The train ride from ZRH to Freiburg takes just 2 hours and by purchasing 90 days ahead from Deutsche Bahn, cost me only 19.